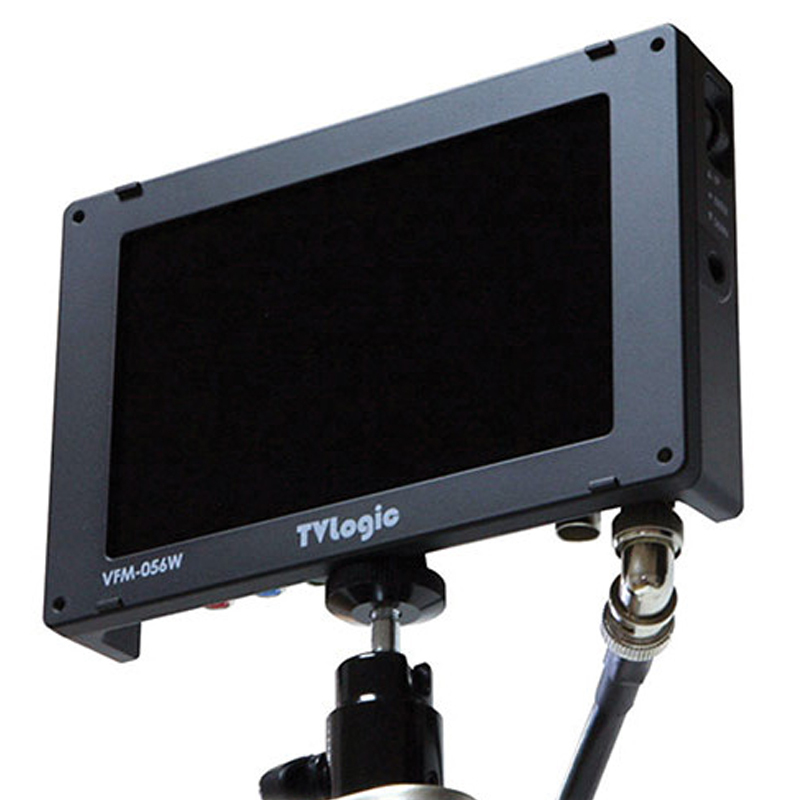 The TVlogic VFM-056WP is an amazingly light and compact viewfinder monitor specially designed for HDSLR and small camcorder shooters. Utilizing 5.6″ LCD panel with high resolution of 1280×800, wide viewing angle of 170 degrees and luminance of 300cd/m2, VFM-056W/WP guarantees the best usability for indoor and outdoor shooting with HDSLR cameras. Innovative and ergonomic design of VFM-056WP makes you comfortable and provides you best performance in the shooting environment. Also, VFM-056WP’s solid and light magnesium case offers stable use and outstanding ventilation. VFM-056W/WP is a state-of-the-art viewfinder monitor specially designed for HDSLR and small camcorder shooters. Utilizing 5.6” LCD panel with high resolution of 1280×800, wide viewing angle of 170 degrees and luminance of 300cd/m2, VFM-056W guarantees the best usability for indoor and outdoor shooting with HDSLR cameras. And its revolutionary ergonomic design with light solid magnesium case achieves the highest efficiency of ventilation. VFM-056W/WP has mounting holes on top, bottom, right and left for most convenient mounting on or near the camera. VFM-056W/WP has outstanding picture quality with bright and clear screen, and wide viewing angle. TVLogic also provides various optional accessories including Sun-Hood,, Acrylic Protector Screen and Battery Brackets that fulfill the needs of professional shooters using HDSLR and Camcorders. FOCUS ASSIST function helps the shooter to easily find out the exact area in the picture withgood focus, simply by adding colors on the shape or boundaries of the object in thepicture. Some HDSLR cameras do not output picture with exact screen ratio of 16 : 9. VFM-056WP covers this problem by scaling the output resolution to fit the VFM-056WPs’ native panel resolution of 1280×800. 2 channels of HDMI embedded audio can be displayed on the screen. Video stream coming from HDMI connector can be delivered (transmitted) to SDI-OUT connector. This function will greatly help the camera crews to communicate watching the same video with 2 monitors. The video format of SDI-OUT is 1280×720 / 59.94p. VFM-056WP analyzes the input Y’ signal and displays the selected level with designated colors for the shooters to decide the optimum exposure level. Waveform : Displays the Luma (Y’) and Chroma (Cb/Cr) components of the input video signal as a form of waves. Vectorscope : Displays the Chroma (Cb/Cr) components of the input video signal onto the YCbCr vector plain. VFM-056WP can analyzes the Luma (Y’) and Chroma (Cb/Cr) components of the input video signal and warn the user with blinking pixels, where the video signal is over the maximum or under the minimum of the designated range. This helps the user to optimize the exposure condition of the camera.